You can now order wooden shelves to match the finish of your slatwall panels, or choose an alternative colour to compliment your boards and colour scheme. Made from 18mm high grade melamine coated mdf, wooden shelves are finished on both sides (top and bottom) for professional cosmetic enhancement. We are able to edge each shelf on 3 sides in a matching finish if required. 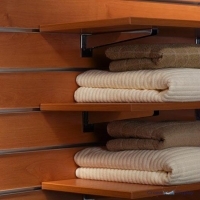 For longer wooden shelves, you may wish to consider some additional brackets for support, increasing the weight load of your wooden slatwall shelving. 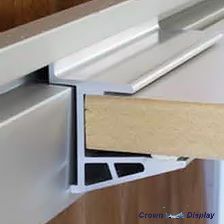 For a display of heavy items, we recommend replacing pvc inserts with aluminium inserts in your slatwall panels. 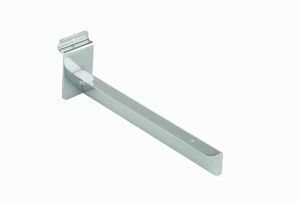 New for 2017 are our discreet brackets which creates a floating shelf appearance. Please see below most cost effective size options alternatively we can cut to any size you require.